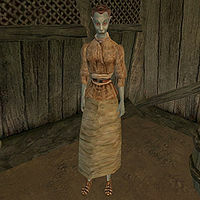 Selvura Andrano is a Dunmer pawnbroker who can be found in Nadene Rotheran's shack, a Camonna Tong hideout in Gnaar Mok. She has a few items available for sale, but nothing at all special or noteworthy. This page was last modified on 13 April 2013, at 01:31.